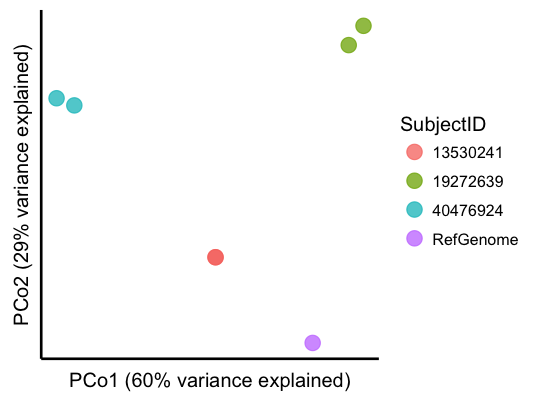 StrainPhlAn is a tool for strain-level resolution of species across large sample sets, based on single nucleotide polymorphisms (SNPs) within conserved and unique species marker genes. The first step in the StrainPhlAn workflow is to run MetaPhlAn2. For additional information, see the StrainPhlAn User Manual. For information on MetaPhlAn2, see the MetaPhlAn2 tutorial. Please direct questions to the StrainPhlAn and MetaPhlAn2 Google Group and subscribe to receive news. The following figure shows the workflow of StrainPhlAn. NOTE if you are running StrainPhlAn in bioBakery (either locally in the VM or in Google Cloud) than you do not need to install StrainPhlAn because StrainPhlAn and its dependencies are already preinstalled. You can then proceed to the How to run section. You can install StrainPhlAn and other bioBakery tools automatically with HomeBrew for MacOS or LinuxBrew for Linux platforms. This will also install all StrainPhlAn dependencies. Alternatively, you can manually install StrainPhlAn from source and then manually install the dependencies. This only needs to be done once to update your PATH in your current session. All future sessions will automatically source this file when you login. Step 3: Install the StrainPhlAn dependencies. Install bowtie2 in a folder in your PATH or specify the path to the bowtie2 executable with each run of StrainPhlAn using the option --bowtie2_exe <bowtie2>. Follow these steps to learn how to process a set of 6 samples with StrainPhlAn. For the purpose of this tutorial, we will use the following set of 6 input files that have been subsampled for rapid analysis. These 6 files are stool microbiome shotgun sequence files from 3 individuals, each sampled 6 months apart. Click on the links to download each file. NOTE that if you are using the Google Chrome browser, it will automatically decompress (gunzip) the gzip-ed files. StrainPhlAn can take as input .fasta, .fastq, .fasta.gz, and .fastq.gz files. Download the set of 6 demo fastq.gz files to get started on the tutorial. Click on each individual file to download. These files will download to your Downloads folder. Once you have downloaded all six input files, make a new folder in your working directory and move the downloaded files there by typing the following commands at the terminal prompt. If you've run the PanPhlAn tutorial, you'll recognize these file names - but these are FASTQ sequence files rather than MetaPhlAn2 bowtie2 marker intermediate files. Why do we need to start with raw sequences for StrainPhlAn? Why is it more informative to perform strain tracking on a collection of related metagenomes, rather than a single metagenome, or metagenomes from extremely different environments? There are four steps to run the subsequent StrainPhlAn analysis. The first step is to run MetaPhlAn2 to obtain the sam output files. The sam files contain the alignment information from mapping the reads of each sample against the MetaPhlAn2 marker database. It takes about a minute to run each command. If you would like to run with multiple cores, add the option --nproc. Why can't this step use the "simple" bowtie2 intermediate files that MetaPhlAn2 saves by default? NOTE that this command can be slow, even with our subsampled tutorial data (from 2 to 10 minutes per sample depending on your computer). If you're impatient, after launching the first command, download the remaining five samples' results from the provided links rather than running them yourself. Providing the sam output files, from the prior step, to the sample2markers script will generate a marker file for each sample. The marker files contain the consensus of unique marker genes for each species found in the sample, which will be used for SNP profiling. Run the commands below (with the caveat above!) to generate the marker files in your current working directory. $ sample2markers.py --ifn_samples 13530241_SF05.sam.bz2 --input_type sam --output_dir . $ sample2markers.py --ifn_samples 13530241_SF06.sam.bz2 --input_type sam --output_dir . $ sample2markers.py --ifn_samples 19272639_SF05.sam.bz2 --input_type sam --output_dir . $ sample2markers.py --ifn_samples 19272639_SF06.sam.bz2 --input_type sam --output_dir . $ sample2markers.py --ifn_samples 40476924_SF05.sam.bz2 --input_type sam --output_dir . $ sample2markers.py --ifn_samples 40476924_SF06.sam.bz2 --input_type sam --output_dir . After successfully executing this command there will be a message printed out that looks something like the output below. Try looking at the .markers files using less. What happens, and why? What information is contained in these files, and why not store it as plain text? Run StrainPhlAn to identify the clades that were detected in all samples, providing the marker files generated in the prior step, to see which clades can be SNP-profiled. If you would like to run with multiple cores, add the option --nprocs_main. The clades.txt file contains on a single line with the species name s__Eubacterium_siraeum. In a real sample, many organisms might be listed, but these demonstration files were constructed by subsampling reads from this species across several metagenomes. When profiling full sequence files (which have not been subsampled), expect to see many more species listed. A reference genome for each species is only required if you would like to include the reference in the phylogenetic tree. For information on how to obtain these sequences, see the StrainPhlan User Manual. Explain the contents of the s__Eubacterium_siraeum.markers.fasta file. The command above reduces the marker_in_clade option default because the input files are small sub-sampled demos. If you would like to run with multiple cores, add the option --nprocs_main. 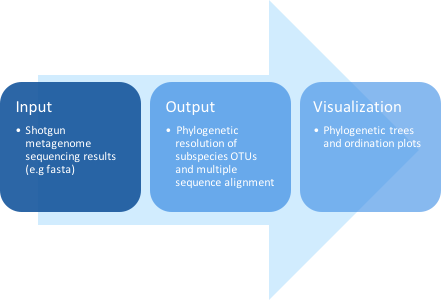 Explain the format and contents of the phylogenetic tree output file. Explain the format and contents of the multiple alignment output file. The sections that follow cover some of the common methods to visualize the results of a StrainPhlAn anlaysis. We will use the ETE Toolkit for quick visualization online. We will also visualize StrainPhlAn trees with the GraPhlAn and the ggtree R package. NOTE that GraPhlAn and ggtree packages are already preinstalled in bioBakery so you don't need to install them. A list of tree editors for exploring phylogenetic trees can be found here. Multiple sequence alignment files can be explored with the R package msa and interactively with Jalview. The tree and multiple marker sequence alignment file from the previous tutorial steps can be input together for an online visualization using the ETE Toolkit. In your browser, go to the ETE Toolkit Phylogenetic tree viewer. Upload the tree and merged marker alignment file from the previous tutorial steps. Select Condensed format from the Alignment image type drop down menu. Click on View Tree!. This will install GraPhlAn and all of its dependencies. Alternatively, you can manually install GraPhlAn from source by downloading GraPhlAn and then installing the GraPhlAn dependencies (numpy, pandas, biopython, scipy, and matplotlib). NOTE that if you are running this tutorial in the bioBakery VM then you do not need to install GraPhlAn because GraPhlAn and its dependencies are already preinstalled. First add the metadata to your tree. Download the metadata.txt file for the steps that follow. Next provide the tree with metadata to create a dendrogram. Follow these steps to create dendrograms and an ordination plot using StrainPhlAn output files, ggtree, distmat, and scripts from Breadcrumbs. Step 1: Install Breadcrumbs with Homebrew. This will install breadcrumbs and all of its dependencies. Alternatively, you can manually install Breadcrumbs from source and then install the dependencies. NOTE that if you are running this tutorial in the bioBakery VM then you do not need to install Breadcrumbs because Breadcrumbs and its dependencies are already preinstalled. Run the following command, to generate two dendrograms, providing the output files from StrainPhlAn along with a metadata file. Download the metadata.txt file for the steps that follow. Here we are decorating the dendrogram with subject ID metadata. Notice that the two samples from subject ID13530241 have identical strains, without any SNPs between them. While this can be a true observation of phylogenetic relatedness, in this case it is an artifact of subsampling. The input files for this tutorial were subsampled to approximately 2,000 reads per file. The scale bar at the bottom of the dendrogram shows the units of branch length; i.e. the number of nucleotide substitutions per site. 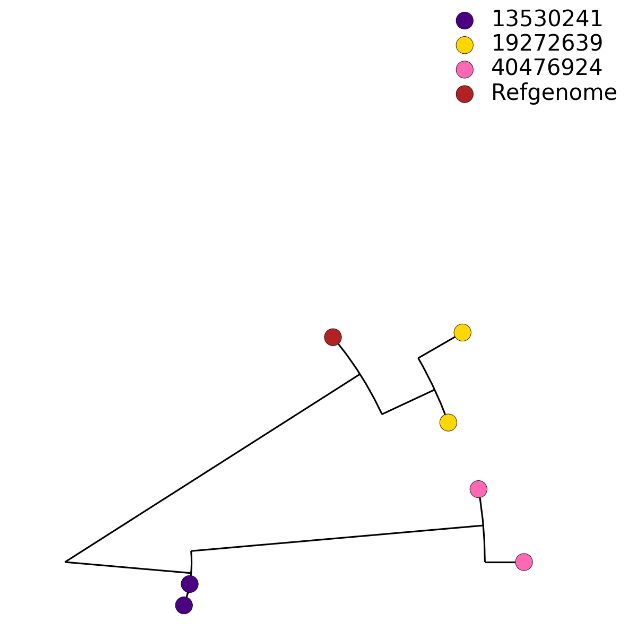 The second dendrogram is also decorated with a slice of the multiple sequence alignment of unique gene marker sequences, where colors in the alignment reveal SNPs. Step 3: Generate an ordination plot. Next, we can use the multiple sequence alignment file to generate a phylogenetic distance matrix that contains the pairwise nucleotide substitution rate between strains. We will use the distmat function from the EMBOSS package. NOTE that if you are running the analysis in bioBakery then you do not need to install distmat because EMBOSS is already installed. Otherwise you can generate a distance matrix using the online implementation of distmat. Once we have the distance matrix, we will use it to perform PCoA (Principal Coordinate Analysis). Following this command provide the MSA input file. When prompted for the correction method, enter 2 (Kimura 2-parameter). When prompted for output file, press the Enter key to accept the default name [s__eubacterium_siraeum.distmat]. The values in the distance matrix represent the nucleotide substitution rate, i.e. the number of substitutions per 100 nucleotides of sequence between a given pair of samples. How does the Kimura 2-parameter distance differ from counting the number (or percentage) of non-identical sites in an alignment of two nucleotide sequences? Given that 97% nucleotide identity is a common threshold for defining that two genomes derive from the same species, are the distances that you're measuring here reasonable for strains of the *same* species? Notice again that, as in the dendrograms above, the two samples from subject ID13530241 have identical strains, without any SNPs between them and are hence overlaid one on top of the other in the ordination. What do you observe about the relative similarity of strains in this visualizations? In particular, how do strains from the same individual compare to those from other individuals? How does the reference strain compare to the metagenomic strains? How might you assign a measure of statistical confidence to your answers above? Which visualization method do you prefer? What are the strengths and limitations of the different visualization methods?